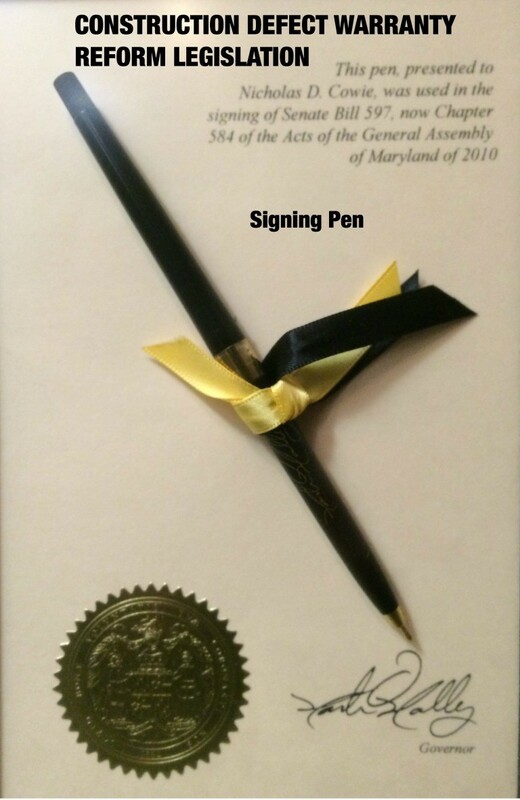 I recently had the privilege of drafting warranty reform legislation that was passed unanimously by the Maryland General Assembly and signed into law by Governor O’Malley, effective October 1, 2010. The legislation, known as Senate Bill (“SB”) 597, is intended to close “loopholes” that unfairly deny homeowners associations (“HOAs”) and condominium associations the protections afforded by statutory implied warranties for construction defects in new residential communities. 1. Extends the implied warranty periods when developers retain control of HOAs and condominium associations for long periods of time so that warranties cannot expire before homeowners take control of the association. 2. Closes the loophole that allowed condominium developers to designate association-maintained, common building systems (e.g., roofs, exterior walls, foundations, etc.) as being part of specified units so that the common element warranty protections would not apply. In effect, redefining “common elements” as “units” to defeat the association’s common element warranties. 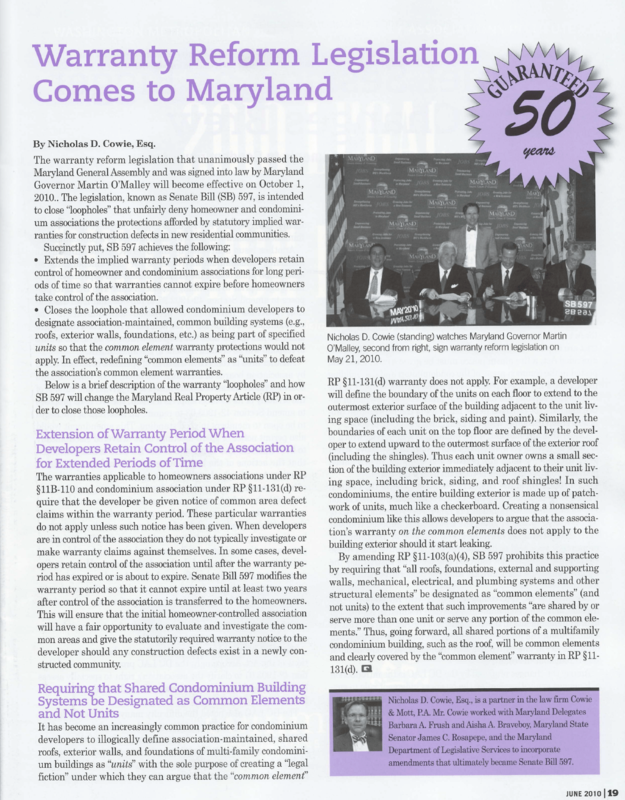 Below is a brief description of the warranty “loopholes” and how SB 597 will change the Maryland Real Property Article (“RP”) in order to close those loopholes. The warranties applicable to homeowners associations under RP §11B-110 and condominium association under RP §11-131(d) require that the developer be given notice of common area defect claims within the warranty period. These particular warranties do not apply unless such notice has been given. When developers are in control of the association they do not typically investigate or make warranty claims against themselves. In some cases, developers retain control of the association until after the warranty period has expired or is about to expire. Senate Bill 597 modifies the warranty period so that it cannot expire until at least two years after control of the association is transferred to the homeowners. This will ensure that the initial homeowner-controlled association will have a fair opportunity to evaluate and investigate the common areas and give the statutorily required warranty notice to the developer should any construction defects exist in a newly constructed community. It has become an increasingly common practice for condominium developers to illogically define association-maintained, shared roofs, exterior walls and foundations of multi-family condominium buildings as “units” with the sole purpose of creating a “legal fiction” under which they can argue that the “common element” RP §11-131(d) warranty does not apply. For example, a developer will define the boundary of the units on each floor to extend to the outermost exterior surface of the building adjacent to the unit living space (including the brick, siding and paint). Similarly, the boundaries of each unit on the top floor are defined by the developer to extend upward to the outermost surface of the exterior roof (including the shingles). Thus each unit owner owns a small section of the building exterior immediately adjacent to their unit living space, including brick, siding and roof shingles! In such condominiums, the entire building exterior is made up of patchwork of units, much like a checkerboard. Creating a nonsensical condominium like this allows developers to argue that the association’s warranty on the common elements does not apply to the building exterior should it start leaking. By amending RP §11-103(a)(4), SB 597 prohibits this practice by requiring that “all roofs, foundations, external and supporting walls, mechanical, electrical and plumbing systems and other structural elements” be designated as “common elements” (and not “units”) to the extent that such improvements “are shared by or serve more than one unit or serve any portion of the common elements”. Thus, going forward, all shared portions of a multifamily Condominium building, such as the roof, will be common elements and clearly covered by the “common element” warranty in RP §11-131(d). Nicholas D. Cowie, is a member of the WMC CAI and a partner in the law firm Cowie & Mott, P.A. After drafting the original legislation, Mr. Cowie worked with Delegates Frush and Braveboy, Senator Rosapepe, and the Department of Legislative Services to incorporate amendments that ultimately became Senate Bill 597. Mr. Cowie organized groups of affected homeowners and worked with community association organizations, such as the CAI LAC, to provide written and oral testimony in support of SB 597 at committee hearings before the Maryland Senate and House of Delegates. 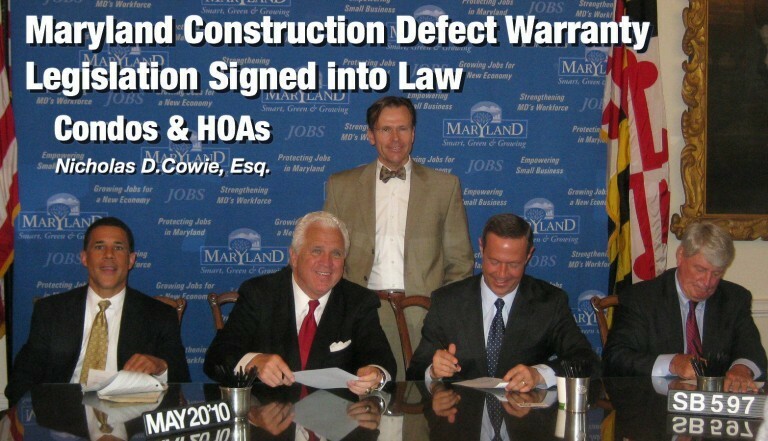 Warranty law attorney Nicholas Cowie, author of SB 597, led the effort to get this important legislation enacted into law in order to close loopholes and extend warranties for Maryland condominium and homeowners associations incases where developers retain control of the association for long periods of time.